I don’t monitor buggy prices, but my impression has been that the buggies in Lancaster are among the more expensive, or at least can be. Stephen Scott had a chart in his book Plain Buggies detailing buggy prices in various communities. Though those numbers are now a little out of date, they give a sense of relative prices. Here are some more photos from the auction. Notice anything interesting? Here is the 2013 Clinic for Special Children Auction schedule, a little late as two have already been held. The next event will be in Shiloh, Ohio, an area with an Old Order Mennonite population. The Lancaster County event, which I know a number of readers have attended, comes later in the summer. Naomi I don’t really know many details on the Old Order Mennonite buggies here but some seem to be keen on the green trim and the metal kickplate material. I asked an Amish person about this once and didn’t really get a good explanation. The metal may be for safety reasons, I guess it would hold up a bit better in an accident. It would seem to me that if it was attached correctly at the side corners it would add a great degree of structural integrity to minimize the sway in the sidewalls of the vehicle. 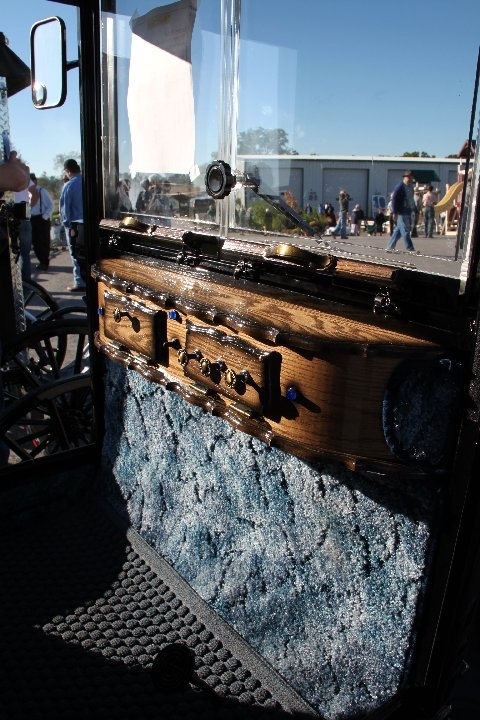 However, I suspect that the real reason they want to use it is that it would be easier to remove the road grime, horse manure, urine etc that can stain the front of the buggy from the aluminum than from a painted surface. Plus, with no paint on it you don’t have to worry about the paint chipping off. That stuff does oxidize and will become duller after a period of time, but it can be revived with a little cleaner (phosphoric acid, if I remember correctly)and a scrub brush. About 100 years ago buggies appeared on the scene with fold-down tops. These are now known generally as Doctor’s buggies. For some reason, these type of tops were rejected by our ancestors and they decided to have only tops that remained in the upright position. The pictures are interesting in that there exists no fold-down option to this day, in spite of all the other comforts allowed. Fancy!! We are actually “here” this week, staying a bit over in Ephrata. 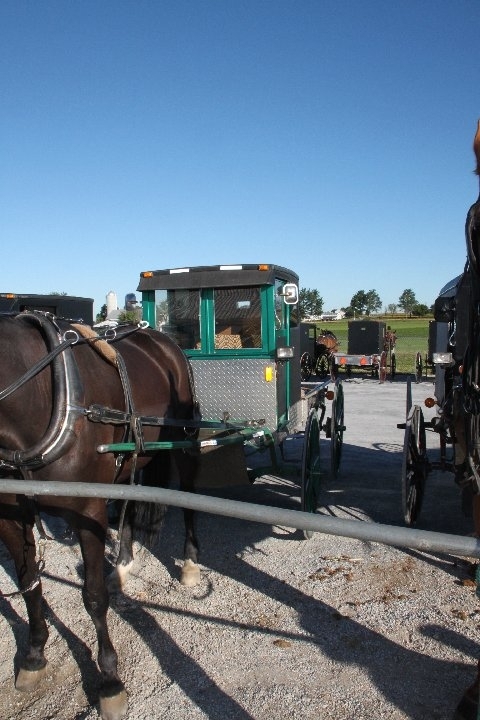 We have noticed lots of buggies, both the black Old Order Mennonite and traditional gray Lancaster Old Order Amish. Why should the Amish be exempt from sticker shock? I haven’t seen any of these fancy buggies around here. The buggies here are totally plain. I certainly haven’t seen any of that sculpted carpet. I’m old enough to remember when $7000-plus was a LOT to pay for an automobile. A few years ago my Father bought a used car from his trusted mechanic. Not including things like insurance and everything, my Dad only shelled out one thousand dollars. I remember my brother criticized him for buying “a pile of junk car” but since Dad’s winter 2011-12 departure from this world, my brother has been driving the pile of junk to and from work with no issue. The clunker will probably stay with my brother longer than his new-upon-sale expensive truck, and not because of the sentimentality of the car being the last one Dad owned, but because it works and gets him from point A to point B. Cheap but working cars are a faded memory from the past, they’re still there. A couple of the buggies above are not Amish. Wow! Do you know what this featured vehicle actually went for? More or less than the retail estimate? I wonder who bought it, and if it’s currently in use. Even without the orange triangle, I imagine it would be easily seen at night, with car headlights illuminating it (might even blind the driver following behind)! 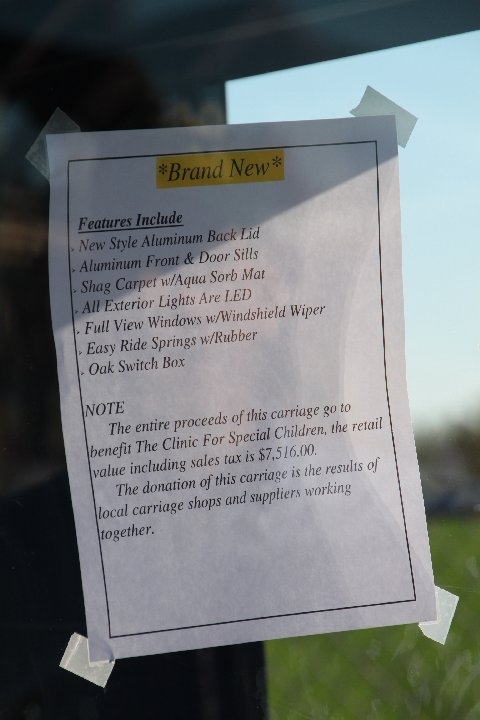 At the Haiti Benefit Auction a couple of weeks ago in Penn Yan, NY they had a new “2 Seater Deluxe Buggy”, to be auctioned off. It’s original price was $8000.00. I wasn’t there long enough to see what it went for. I believe, it was a Mennonite buggy. I remember when I paid less than that for new a car. I asked Mark about the fold down top option on open buggies. He said that nobody had one in Belle Center although there are more open buggies then there were. He said that he has heard that the open buggies with the fold down (calash) top are becoming popular with the young boys in Holmes County. I have seen more than one similar to that around the Smoketown/Strasburg PA area. I have also seen a few open top buggies. Hope to head back up that way in a couple of weeks for work! I don’t believe the Leola sale has all that many buggies for sale (or horses) compared to a mud sale. It would be interesting to know what that buggy sold for… there has been some deep pocket support for CSC at the auctions I have been to in Leola, and it couldn’t go to a better place. A hand made half-scale hit-and-miss engine with a housing around it that looked like a tractor that powered an ice cream maker was a big seller at last year’s sale – over $14 thousand. Am I wrong to suppose that some of the more non-traditional style buggies are more, to use an English term, auto-show models. They could be put out to show what the manufacturer is capable of producing, wither or not the buying population buys them or not is a different matter. Agree or disagree? I asked Mark about Amish buggies being made. He said that just about all Amish buggies are custom built. Unlike cars where you just go into a dealership and buy one off of the floor. There are a couple of big sellers of Amish buggies where maybe you could do that such as Winesburg Carriage in Holmes County. But that business, owned by an Amishman, doesn’t make any of their own buggies, he gets them from other buggy shops. Because of the differences in the ordnungs for buggies in different Amish churches and communities it is not practical to build too many buggies of one particular kind. In Mark’s community all of the buggies are custom made to order. The basic buggy frame and exterior is the same but choice comes as to: upholstery, lights, springs, brakes, interior trim, etc. 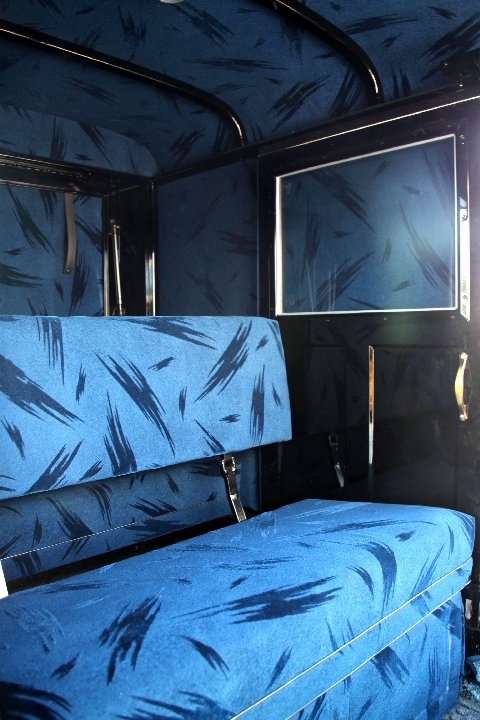 I was fascinated with the carpet and the upholstery. The metal bed of the buggy was interesting also. I hope to be able to attend an auction like that sometime in the future. We were at the 2012 Leola auction. 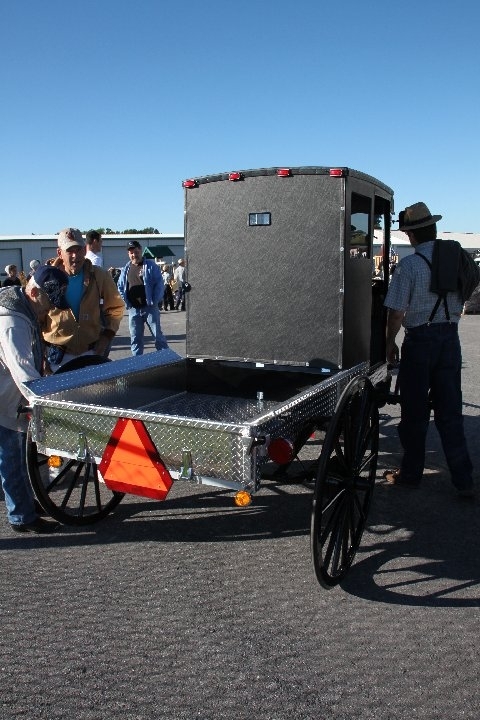 The interior shots [and “window sticker” photo] were of an Amish (style) buggy that was parked next to the “Mennonite Pick-up” with the diamondplate box. Sorry, we left before either went up for bid so we don’t know what they finally went for. If anyone does attend this year, bring your appetites!